It's getting easier, but it still takes forever. Grading almost 130 essay tests--it's not for the weak. My students are getting quite good at taking 40-minute timed essay tests, much to their annoyance. I've had a few teachers, a few parents, and more than a few students ask me why I give so many essay tests. What good do they do? Why give essay tests instead of standard fact-check tests? 1. Standard tests do very little to reveal a student's understanding of material. Regular tests (multiple choice, T/F, matching, etc.) measure a student's ability to memorize facts for a short time, or they demonstrate their ability to deduce an answer from context, that's true. Short-term recollection of facts brings short-term results, and I want so much more than that for them. 2. Essay tests measure what they understand. While an essay can be manipulated somewhat to reflect a student's strengths, essay responses cannot mask a student's lack of understanding. Either you can answer the question, or you can't. If you try to fake it, I can tell. And they know it. 3. Essay tests develop cross-curricular skills. Although I teach American History, essay tests reinforce English skills like writing thesis statements, structuring writing logically from introduction to conclusion, grammar, punctuation, voice, and appropriate writing style. A few of my students complained about "learning English in History" early in the year, but the English teacher is behind me all the way! 4. Essay tests improve critical thinking skills. Linking information from original documents, class discussions, video presentations, textbooks, and other classes is an overlooked skill in today's "teach to the standardized test" environment. My students take quotes from George Washington, information about Andrew Jackson, and text from the Progressive era, and they synthesize all of these sources to answer a prompt about the modern rise of Populism and how it applies to President Trump's election. To me, that is much more valuable in the real world than merely knowing Teddy Roosevelt was president from 1901-09. Not only can they write about it, they can also discuss it intelligently, listening to others' opinions while gradually shaping their own thinking. 5. Timed essay tests teach students to function under pressure. ACT, SAT, and other standardized tests require completion within set time parameters. Without practice, the stress of timed tests can negatively impact student test scores. Unfortunately, the stress of a timed test environment can't be simulated; it must be practiced. My students initially complained and fought against the constraints of a 40-minute time limit, not knowing how to gauge the clock. They would either finish too early and not complete their thinking, or they would be begging for just a few more minutes at the end to wrap things up. Now, with nearly a dozen timed tests under their belts, they've become much more focused, calm, and capable of expressing their ideas before the timer sounds. 6. Essay tests allow me to look inside each student. This is the (not-so-secret) reason I truly love essay tests--I get to know each of my kids on a very personal level. I tell them that all the time, and I mean it. I see what subjects are important to them through their writing. The minutes I spend with their essays are minutes spent with each of them on an individual level. Sometimes they leave me footnotes to their work or funny drawings in the margins or quote me as a source. I always leave personal comments back to them, making sure they know I appreciate the work they put in this time or that I noticed how much better their writing has gotten or that I can tell they're trying to improve a skill they struggle with. I'm a hard grader, but I'm fair, and they know that I will work with them as often as they ask. 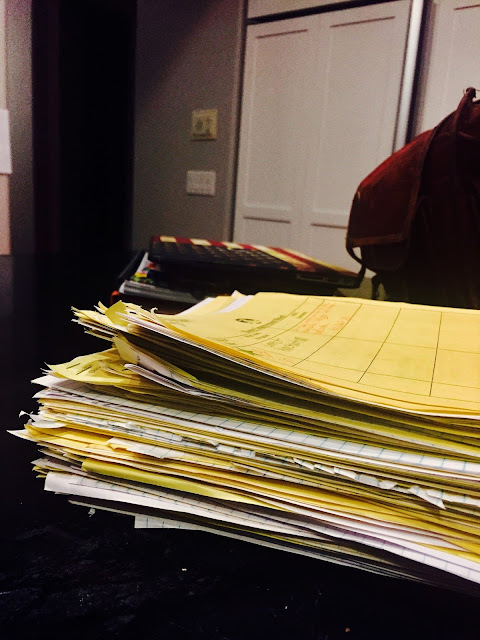 Grading 128 essays takes about 8 hours of my time, but I find that time well spent as I come to know each of them better through their writing. The complaining has lessened over the school year, and the best moment of all came as I announced the second essay test of this semester. Many of the kids started complaining and begging for no test, but one student's response shocked me. One of the biggest complainers from last semester, this student struggled to make the leap between regurgitating facts and thinking, rarely trusting that she could get a good grade. Instead of complaining, she turned to the class and casually said, "Guys. They're not that bad. Really." That's when I knew that I had made a small difference. This weekend, I will be ankle deep in yellow scoring sheets and prompt pages, but I know all the time I invest in them is so worth it.